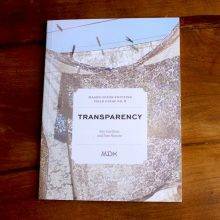 With great joy we welcome Judy Wright as a new contributor to MDK. Judy has been our friend and co-conspirator in crafty and culinary pursuits for many years. You may know her from her absolutely delicious cooking and gardening blog, Judy’s Chickens. (Be sure to subscribe if you’d like your in box to become a wonderland of sweet things, gazpacho, and the perfect frittata.) Judy is currently at work creating a delicious new feature for MDK. Until it launches, we invite you into Judy’s kitchen for a typical day in her fantastical world where you never know what might be cooking. 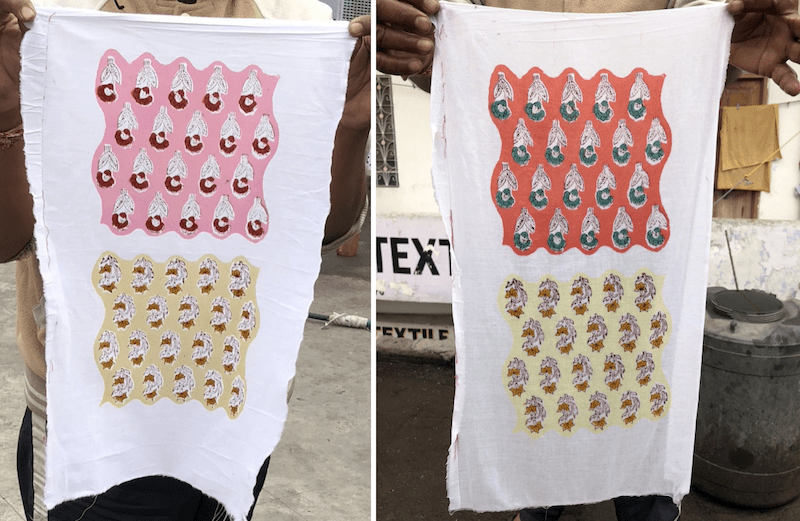 On a recent trip to India, I toured a block-printing factory in Jaipur. I learned from a young man named Ali that their factory printed with natural dyes made from plants like tomatoes, pomegranates, turmeric, sugar cane, and indigo. 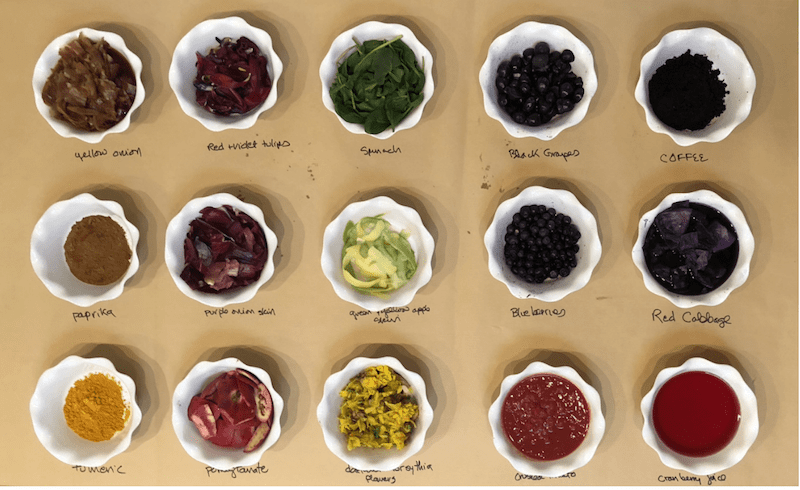 My takeaway was that you could pretty much make fabric dyes from anything that ever stained your clothes, aprons, or dish towels while you cooked. When I got home, I went a little cuckoo. I poked through my kitchen spices, vegetable bins, backyard garden, and the grocery store, looking for foods and flowers I could potentially use to make dyes. 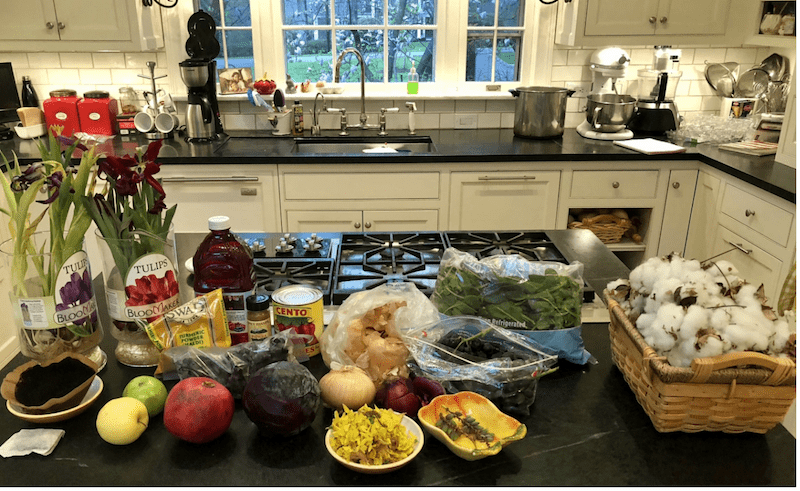 In the end, I chose pomegranates, dark grapes, blueberries, tomatoes, cranberry juice, red cabbage, spinach, turmeric, yellow and red onion skins, paprika, apple skins, used coffee grounds, daffodils, forsythia, and tulips. Crazy as this all seems, I got into the zone on this project. I laid down a long sheet of brown paper and filled fifteen bowls with food and flower samples, some of which I had pre-cooked. I couldn’t cook them all because I didn’t have enough pots or time. I filled each bowl with boiling water and let the materials meld for a few hours. Afterward, I mashed the plant materials in each bowl, heated them in the microwave, and strained out the pulp. 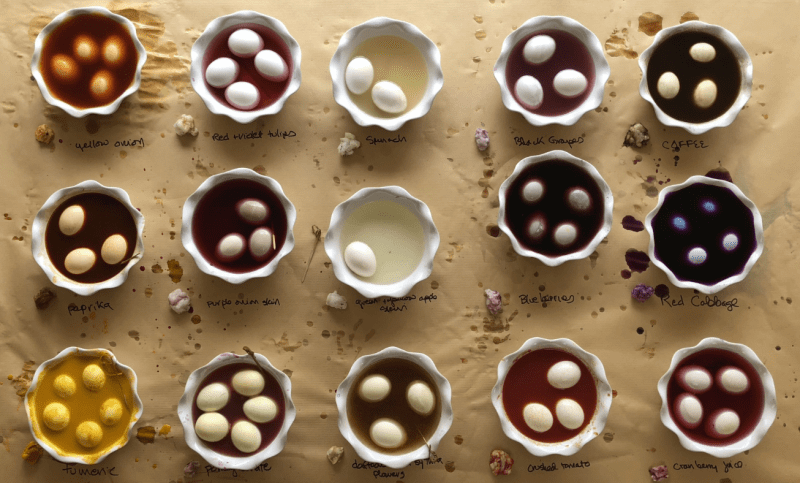 I added hot, medium-sized, hard-boiled, white eggs into the strained warm liquid and let them sit for a while longer. The results were mixed. Some of the dyes produced rich dark colors, some were pale, some were lightfast, some were not. My favorite new colors were a lovely chartreuse from the pomegranate, a golden yellow-brown from the daffodils and forsythia, a pretty mocha-brown from the coffee grounds, and a light orange from the paprika. While I used the dyes for eggs, in my head I was thinking about how they might dye fabric. I could see how some of the colors in the swatch below could be created from the colorful dyes I had made over the years. Meanwhile, I have a small crop of indigo growing in my garden here in Nashville. I know! It’s incredible. What will happen with this magical stuff? I can hardly wait to find out. 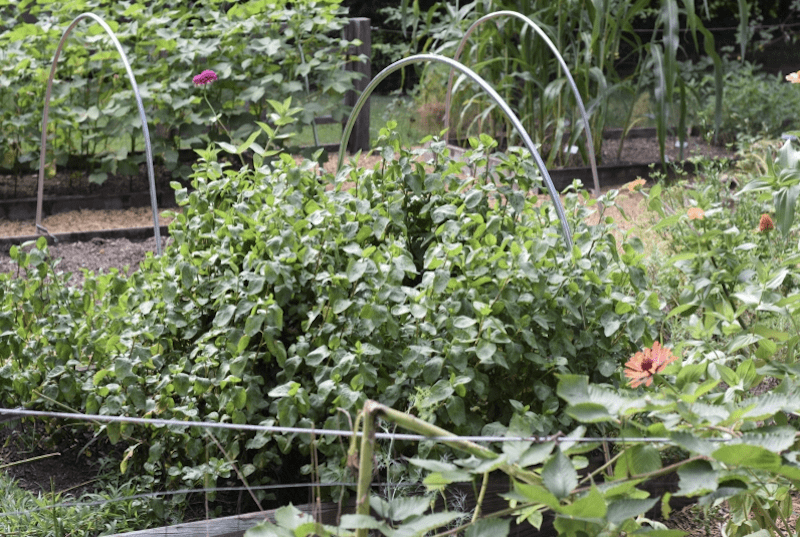 The author of one of the most delicious food and garden blogs, Judy Wright has boundless curiosity about just about anything having to do with nurturing food, family, friends—and the chickens in her backyard. Follow her adventures at Judy’s Chickens. Welcome, Judy! You always have interesting information to share. Thanks for this article. Thank you, Diane! So excited! Interesting! I suggest that you try carrot tops – a strong yellowish green – and the root of an old rhubarb plant – a deep orange. With red cabbage, you can get a pale pink or a pale green, if you add bicarbonate of soda. Walnut husks will give you a wonderful rich brown. It’s a big subject: people have written, and published, books on it. Thank you for the new leads on vegetables to try to make new colors! I’ve filed it. 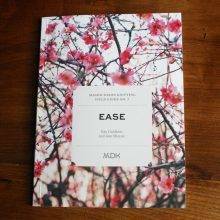 Since I’ve been back from India and written this post, I’ve bought a few inspirational books on making natural dyes. It’s all so fascinating. I can hardly look at fruits, flowers and nuts without wondering what colors they would produce. Thanks for writing! Carrot tops are excellent in pesto too, if you run out of eggs to dye…. Good to know! Had no idea! Carrots, too, the veg itself, makes a wonderful pesto, just chunk it, add the usual olive oil, garlic, parmigiano, and blend. Lovely golden color and great on pasta. Daffodils are poisonous. Is that a concern for something you might eat? Good to know. I’ll be sure not to eat those eggs next year. I did this experiment in March, two days before Easter. Sadly, daffodils, forsythia, and a few daffodils were the only flowers in my yard. Nowadays, I look at every wild flower as a potential dye: ironweed and goldenrod beckon me. How beautiful and fun! I like the blue eggs you ended up with – I assume from the blueberries? In my mind, there are just not enough blue flowers, vegetables or fruits out there! Wanda, I made the blue eggs with purple cabbage! That was a huge surprose. Yellow onion skins made the orange eggs. Turmeric made the bright yellow. Those colors were all lightfast. Many of the others faded. I guess I better get some purple cabbage in the ground for next year! 🙂 Also, the indigo plant is beautiful and so hardy looking – I hope you get some good dye from it. Purple cabbage juice is awesome. It’s an “indicator” for acids and bases, so you can do science experiments with it. It will turn pink in the presence of acids and blue-green with a base. Turmeric also reacts with acids — it will turn red! So good to know, Kristi. Are the colors light or colorfast when applied to paper of cloth? What acids and bases do you use when you do experiemnts? This is all so interesting. Thank you! Can’t wait to see your results with fabric! This is so cool!! Thank you. Once you move to applying this to fabrics, you need to learn about mordants to make the colors colorfast. That’s a whole ‘nother rabbit hole I’ll be traveling down once I’m finished tending to my vegetable garden. Orange onion skins was my favorite. 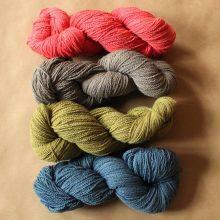 One of the few dyeing workshops I have done was with natural dyes. I find this so satisfying! I can’t recall everything we used, but marigold and black walnut were in there. 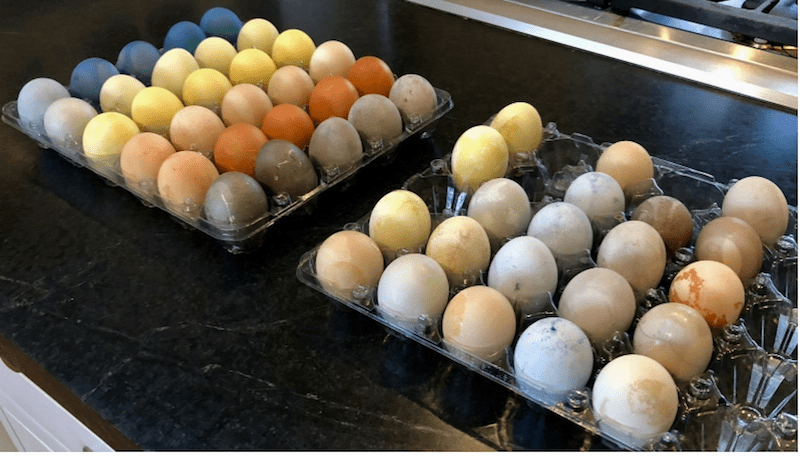 What a great idea to experiment with egg dyeing! Every Easter, I try new vegetables and plants with relatives who are visiting for the weekend. It’s fun! Love it – I’m going to have to try this! Great fun! I have used beets to dye paper and fabric. The red ones make lovely fuschia colors. Now I want to try other veggies! One time my DH was slicing up mushrooms and wiped his hands on the dish towel. Even Clorox could never wash out those brown stains. Thank you! I’ll add mushrooms to the list of vegetables to try! Glad to see you here and I also can’t wait to see how the indigo goes. Years ago, in a burst of enthusiasm about learning to spin, I made a whole lot of white yarn. And put it in a drawer. 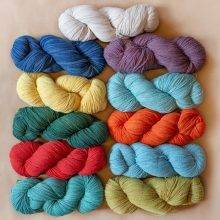 Many years later, I came across a woman who dyed it for me, who used discards at the local farmers market. My first handspun would win no prizes, but the colors sure are pretty! It’s so rewarding to use up food in unconventional ways. I’m a big proponent for No Waste in the kitchen. Thanks for sharing. Thank you, Kathy! Hope you find some good recipes to try. 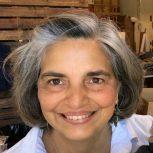 Glad you liked the article on natural dyes, too. 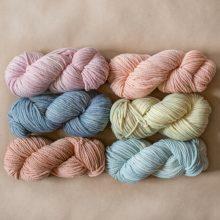 I’ve been playing with natural dyes for a few years now. One *new* thing I realized/learned lately ia that dyes react differently on animal-based fiber and plant-based fiber. I’ve been dyeing wool yarn, but am going to throw some untreated cotton into the exhaust pots, just to see what happens. I look forward to your experiments! So true. When I dyed wool with my first vat of indigo dye in a workshop, it took up the dye intensely the first time it was dipped. The yarn was gorgeous! The cotton items I dipped needed multiple dippings to achieve an indigo color. There is so much chemistry about all of this that I don’t understand. Yet. Meanwhile, making natural dyes is like making your own bread– it’s very satisfying, although not necessary in this day and age. Thanks for writing! Eggs! What genius! I am glad that Ann and Kay only said my inbox would be filled with deliciousness, rather than my kitchen, because precious few of the lovely ideas from Ms. Chickens see reality in my house. Hahaha, as usual, well put! Since I’ve started playing with botanical colors, I look at wildflowers along the road in a completely different way. Now, I wonder if I could get a colorfast dye out of them. By the way, I just finished a good book about extracting indigo from leaves grown on a plantation in SC during the 1700s. The book is called “The Indigo Girl” and is a story about Eliza Pinckney’s attempt at growing indigo as a commercial crop in the South. It’s historical fiction. It was a page turner. Great to hear from you, Quinn!